But the razor-thin surface between the Tapeats and the underlying Proterozoic-age rock reflects the passage of far more geologic time –about 600 million years where the Tapeats sits on top of the sedimentary rocks of the Grand Canyon Supergroup. Those rocks are easy to spot on the photo above because they contain the bright red rock called the Hakatai Shale. Even more time passed across the surface where the Tapeats sits on top of the 1.7 billion year old metamorphic basement rock. 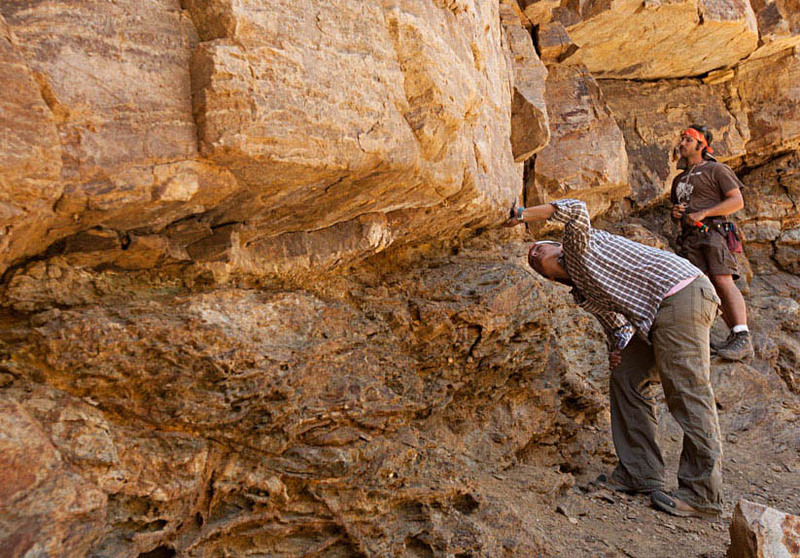 You can put your thumb on the basement and a finger on the Tapeats –and your hand will span 1.2 billion years! An exposure of the Great Unconformity in Montana. Notice how it’s a 3D surface that extends back into the wall. These surfaces, where sedimentary or volcanic rock was deposited upon much older rock are called unconformities. This particular one, beneath the Tapeats Sandstone, is called the Great Unconformity. You can visit other exposures of the Great Unconformity in many places throughout the American West, including Wyoming, Montana, Colorado, and even Wisconsin. Unconformities –and all sedimentary bedding surfaces in general– are visible where erosion has cut across them and exposed them to view. Being three-dimensional surfaces, they extend underground in all directions from there. What’s more, before the overlying rock was deposited, each of those surfaces used to be Earth’s surface. Think about it. Sedimentary rocks form from sediments, and sediments are deposited on the seafloor or land–the Earth’s surface. So if you could strip away the Tapeats and everything above it, you’d be looking at Earth’s surface just before the Tapeats was deposited. And depending on where you are, the Tapeats sits on different rock –because different bedrock characterized the Earth’s surface during the early Cambrian just as it does today. If you look north up the long and straight Bright Angel Canyon, you see the red-colored Hakatai Shale beneath the unconformity on the west side of the canyon; on the east side, you see basement rock. View north up Bright Angel Canyon. Tapeats Sandstone overlies Hakatai Shale on west side and basement on east. Faulting and erosion, before deposition of the Tapeats, explains some of these differences according to the diagram below. 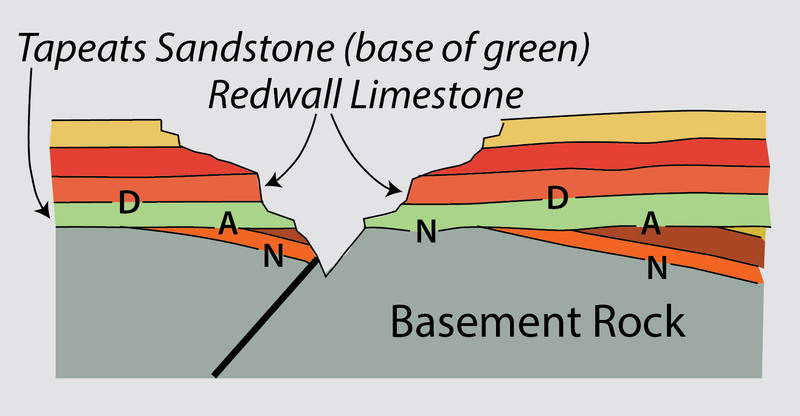 The first cross-section, Stage A, shows the scene after deposition of the Grand Canyon Supergroup atop the basement. Notice that the surface between these sedimentary rocks and the basement is also an unconformity. At stage B, the fault that extends up Bright Angel Canyon causes tilting and lifts up its eastern side. 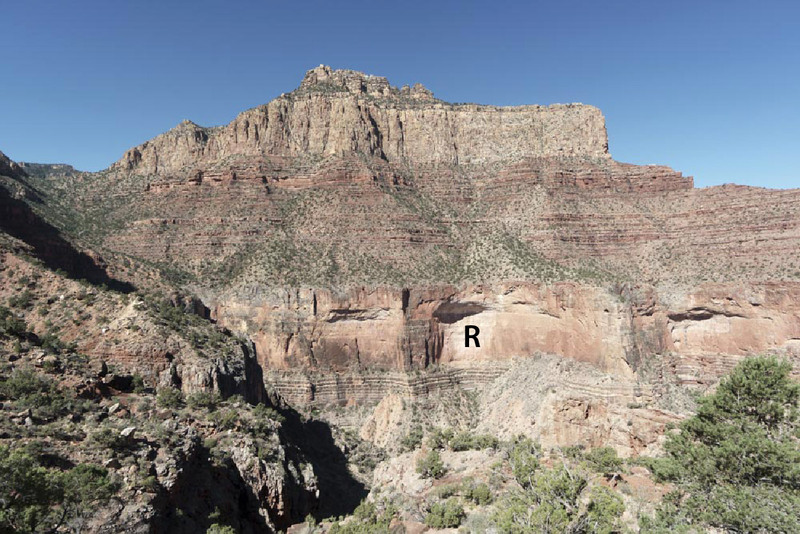 Later erosion (stage C) removed the uplifted Grand Canyon Supergroup to expose the basement. On the down-dropped west side, those rocks were largely preserved. Notice that in stage D, the base of the Tapeats Sandstone (in green) corresponds to the land surface of stage C. Stage E represents today’s landscape as viewed across Bright Angel Canyon. We have different names for unconformities, depending on the rock beneath the surface. If it’s metamorphic or intrusive igneous rock, such as east of Bright Angel Canyon, it’s called a nonconformity. If it’s sedimentary or volcanic rock that’s tilted at a different angle from the overlying rock, it’s an angular unconformity. If it’s sedimentary rock that’s parallel to the overlying rock, it’s a disconformity. The Grand Canyon is full of disconformities that you don’t notice because the rocks are parallel. One of the more impressive ones is between the Mississippian Redwall Limestone and the Cambrian Muav Limestone (top of the green layer on the right). Along that surface, rocks of both the Ordovician and Silurian periods are missing! Paleozoic Rocks in the Grand Canyon. Redwall Limestone (R) rests disconformably on the underlying thin-bedded Muav Limestone. There are also buttress unconformities. To see one of those, you get to go for a hike! You can see the Great Unconformity up close if you hike to it –by following any of the trails that descend from the Grand Canyon’s rim to the river. The steep grade makes both the descent and ascent unusually arduous, so it’s a far more enjoyable trip if you do it as an overnight backpack. Earlier this month, I hiked to the unconformity via the New Hance Trail, one of the national park’s less used trails. Much of the hike involved scrambling and looking for the trail –so I was thoroughly spent (and grateful) when I made it back to the rim. But in Red Canyon, which was my destination… Wow! I practically lived and breathed the Proterozoic! For one thing, the rocks are beautiful. There’s the red Hakatai Shale, deposited in coastal plain and deltaic environments, with its thin beds and occasional ripple marks and mudcracks. And there’s the underlying Bass Formation –which is mostly limestone but has this amazing maroon-colored sandstone where I had lunch. There you can see fragments of an algal mat that were ripped up by a storm and distributed throughout the overlying sand bed. And these rocks form the canyon walls and make everything red. Above them? Flat-lying Paleozoic rock sitting on the Great Unconformity! Angular unconformity between the Cambrian and tilted Proterozoic rock in the Grand Canyon; the buttress unconformity exists where the Tapeats Sandstone pinches out and the overlying Bright Angel Shale abuts the brown knob of Shinumo Quartzite on the right. The knob persisted as an island during the Cambrian Transgression–close-up below. And that’s where you can see the Cambrian island, right next to a buttress unconformity. 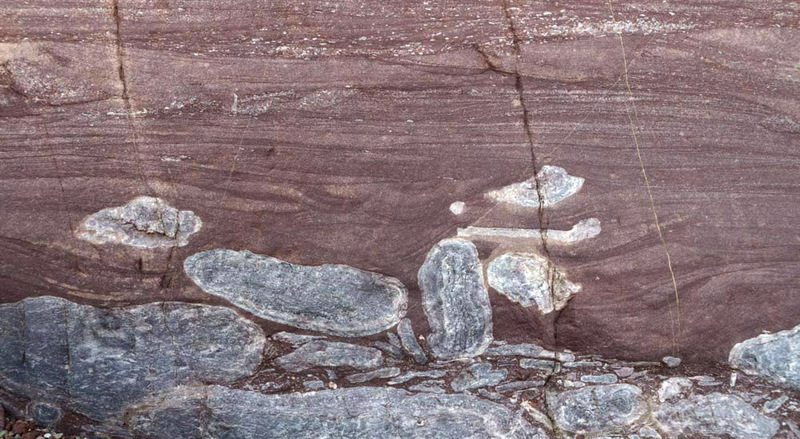 The Shinumo Quartzite, a Proterozoic rock that overlies the Hakatai Shale, is such a strong and resistant rock that it defied erosion during the Cambrian Period. A large block of it stood above the landscape as an island that persisted all through Tapeats time and into Bright Angel time. The ancient island towers over Red Canyon, with the Tapeats Sandstone and Lower Bright Angel Shale thinning and then pinching out against its sides. You can imagine the scene, with a rising sea surrounding the island and depositing Bright Angel Shale around it. As the sea rose over the island, more shale was deposited, eventually burying the island. Now that the Colorado River and its tributaries are eroding the canyon, the island’s exposed. This block of Shinumo Quartzite persisted as an island during much of the Cambrian. That’s the buttress unconformity— where the younger rock is deposited against –and so abuts– the older rock. 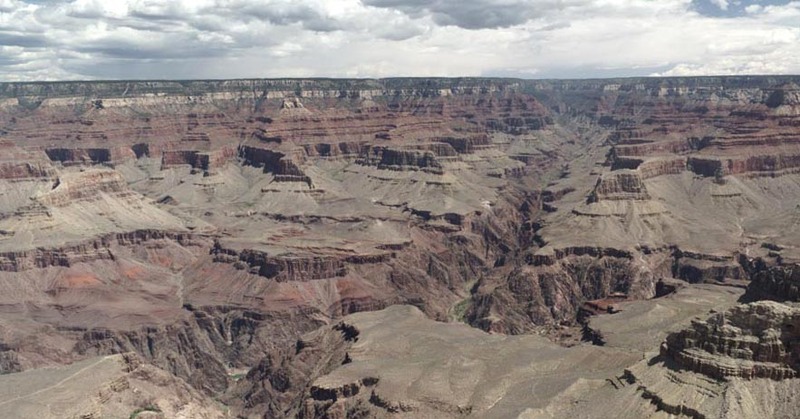 These photos –and more of the Grand Canyon–are all freely downloadable from my website Geologypics.com. Just type “Grand Canyon” into the keyword search! I love reading your posts. I learn something more about geology every time! The Cambrian Island explanation was fascinating … I shared this post with GSOC. Thanks for the nice words, Wes –and thank you for sharing! Thanks, Marli! Great pictures, lots of details to ponder. I have not seen many buttress unconformities that I didn’t think might be fault zones instead. Good to see a well-exposed one! Thanks Ralph! Thanks for the nice words and for the added info. I’ll be sure to havea look at the paper!